Common Name : Asok, Ashok, Asogam, Wu You Hua, Osaka. Part Used : Bark, Leaves, Flowers, Seeds. Habitat : Throughout india in evergreen forests. Uses : The bark contains tannins and some chemicals and is prescribed as a tonic. Crushed flowers and leaves are rubbed on the skin to get relief from skin diseases. When selecting trees for avenues or large gardens, it will be an excellent idea to choose Saraca asoka instead of the usual rusty shield bearer or the ubiquitous gulmohur. The dried flowers are used in diabetes and haemorrhagic dysentery and seeds are used for curing bone fractires, strangury and vesical calculi. The flowers are considered to be a uterine tonic and is used in cases like burning sensation, dysentery, hyperdypsia, scabiesin children and inflammation. 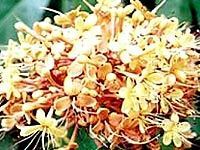 It is also used in fever, dipsia, colic, ulsers and pimples. The seeds are strengthening and the ash of plant is good for external application in rheum-arthritis. It is considered as best female tonic.